It’s hard to know what to eat for lunch when you work from home. Unless you live somewhere a lot cooler than me, gone are the days of sushi on a Monday, falafel on a Wednesday and mashed-avocado-something on a Friday. For a long time I relied on fish-finger sandwiches or cheese toasties, both of which are delicious in their own right but, long-term, don’t tend to deliver much in the way of either filling you up for the afternoon, or providing much nutritional benefit. So recently I switched to salads in the summer and soup in the winter. You really can’t beat toasted cheese though, so here it is, ingeniously incorporated into some soup. Lancashire cheese is perhaps not one of Britain’s most famous territorials but it is justly renowned for one particular thing. As far back as 1824, Lancashire cheese was being praised as a ‘good sort of toasting cheese’ by agricultural writer R W Dickson; it bubbles and browns nicely without getting too stringy or dribbling fatty pools. I was recently sent some Dewlay Crumbly Lancashire, to review as part of Aldi’s new range. Dewlay were founded in 1957 and are based in Garstang, in the heart of the Lancashire fields, north of Preston. Their Crumbly Lancashire is young and fresh-tasting, slightly acidic in a pleasant, lemony way. 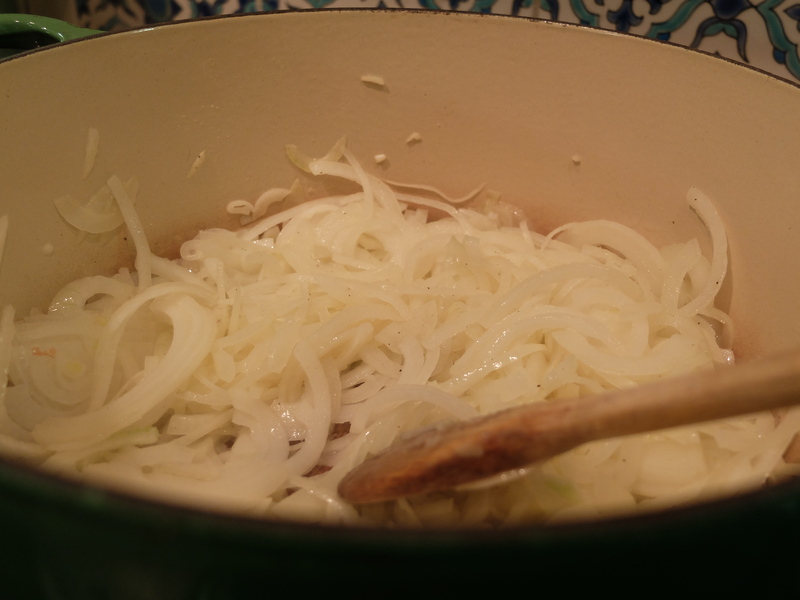 It looked to be a great topping for a rich, sweet, red onion soup. Melt the butter and oil in a large pan over a low heat. Season the onions with salt and pepper and cook them until they are soft and sweet; this can take up to an hour. Make sure they don’t catch and burn on the bottom of the pan. Stir in the wine. Increase the heat a tad and stir for five minutes, to glaze the onions. Sprinkle in the flour and stir for two minutes more. Pour in the stock, add the thyme leaves and bring to the boil. Reduce the heat to low, put the lid on and leave it to simmer for 30 minutes. Taste and adjust the seasoning as required. Meanwhile, divide the cheese between the slices of baguette and grill them for a couple of minutes, until the cheese is bubbling. Remove from the grill and serve on top of the soup. Interesting to see what they are stocking, it seems to vary from region to region. We amazingly now have an Aldi and four (count ’em!) Lidls in and around Tooting. OH MY GOD!! I was just on bbc Wales news as it might be flooding near my friends Gareths leek farm which was destroied last year under the water when i saw your soup! Im going out in a minute to asda to buy all the things in it and to make it. Im not using wine as i hate the stuff and i dont like french bread since brexits (but i think that i can use sunblessed ok) and i hope that it will tatse as good as yours looks! Let me know how you get on, Terry. The wine isn’t essential but if you use Sunblessed, maybe go with the crusts, as they are less likely to sink! Good luck. Oh, just the very word ‘toasts’ sounds cosy, doesn’t it! This looks delicious as always. Thank you! Yes, this is real comfort food, I think.